It is not every day that the south-nordic area is blessed with such elevated, scholarly visits from abroad, as we have had the pleasure of experiencing this summer (2007). One of the true giants of modern Donaldism, Mr. Gilles Maurice of France, has honoured the Danish Donaldistic Association DDF(R) by attending its annual summer-meeting, which this year took place in the Ornitide metropol of Store Fuglede (:"Big Bird Forest-Clearance") on Zealand. In spite of a still surprisingly young age, Mr. Gilles Maurice has for long established himself as one of the leading Donaldists of the 21st century. He was one of the very first to put Donaldism on the internet (Calisota Online) and thereby initiating contact between practising scholars of the school all over the world, and furthermore to combine this ongoing network with actual presentations on the internet of his studies. Studies, which have proved to be of the absolute highest rank and has to impress all with its combined quantity and quality. The Council especially refers to Mr. Maurice's work with Donaldistic genealogy and cartography, on which topics the Council recognizes Mr. Maurice as the leading capacity of today. The genealogical work of Mr. Maurice takes two roads. Firstly, Mr. Maurice has taken it upon him to register, collect and present every single attempt throughout time to clear up the apparently rather complicated genealogical relations in Duckburg. This ambitious project has resulted in quite a forest of family trees, all presented and adequately commented by our skilled "forester", Mr. Maurice, on his genealogical website. Most of the trees are concerned with the Duck Family, but also several of the other main families in Duckburg are included. Furthermore, Mr. Maurice has since 2001 engaged himself in creating the "mother of all Duck Family trees", taking into consideration every single genealogical piece of evidence of the Ducks to be found in Donaldistic source material of all times from all over the world! The proportions of this task would seem overwhelming to most of us, and this crazy idea alone could justify a Ducktoral degree, but what is even more impressing is that he actually has succeeded in implementing his ambitious project. The "My Duck Family Tree" of Mr. Gilles Maurice will undoubtedly stand out as a central key work of Donaldistic genealogy for generations, as well as being a fine example of following the highest goals thinkable in our school. Besides "mapping" the various branches and twigs on the Duckburg family trees, Mr. Maurice has also established an impressive and extremely educational map room of Duckburg cartography, which is a genuine must to visit for everyone interested in the geographical-cartographical appearance of the World of Ducks. You will not necessarily leave the map room with a more clarified idea of Duckburg geography, but then again, good academic Donaldism is usually not about clarifying things as much as making simple-appearing matters much more complicated, while having a good laugh about it. The map room of Mr. Maurice will do both these things for you. Based on the above-mentioned grounds, The Academic Council of S.A.D. 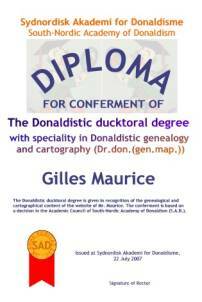 has unanimously decided to confer Mr. Maurice with the Donaldistic Ducktoral degree, which we hope he will accept and receive as the token of honour, respect and appreciation, as which it is meant. 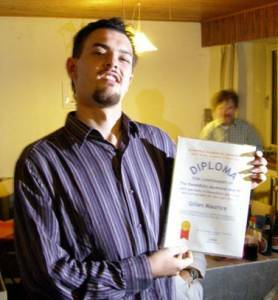 The Ducktoral degree is honourable only, and thus not followed by any financial prize, but apart from the right to henceforth carry the academic title of Dr.don., Dr. Maurice has received a Ducktoral diploma to prove his conferment, a diploma, which was handed over by Dr.don. Asger Pedersen, who himself received the Ducktoral degree from the Academy1½ year ago. Hopefully, more Ducktoral conferments from the S.A.D. will follow in the future. Certainly, any Ducktoral prospects would do wisely in checking out the website of Dr. Maurice for inspiration. Sydnordisk Akademi for Donaldisme henleder opmærksomheden på, at rettighederne til (næsten) alle de anvendte billeder på Akademiets sider tilhører ©Disney, der i Danmark er repræsenteret ved Egmont Serieforlaget A/S. Billedmaterialet må ikke anvendes i erhvervsmæssigt øjemed. Billederne anvendt på præcis denne side tilhører dog for de flestes vedkommende Gilles Maurice og Calisota Online.